The Information reported last week that in 2014, only 11% of tech IPOs in 2014 were profitable when they became publicly traded companies, an all time low stretching back to 1980, when the figure was 88%. This raises the seemingly absurd question, how important is it to be profitable for a startup? After all, growth is the largest determinant of valuation at IPO, not profitability. Only 19 of the 48 publicly traded SaaS companies in the basket I track have ever recorded a financial year with a positive net income. 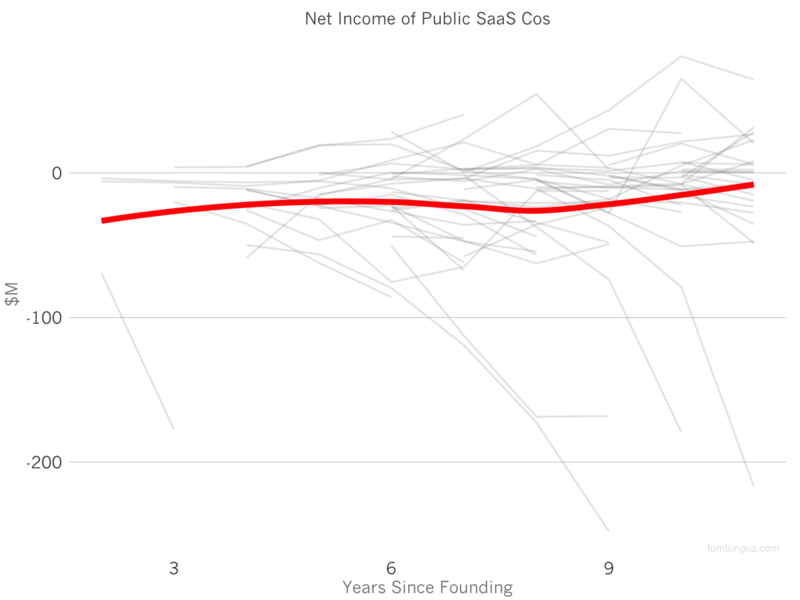 As the chart above shows, the median publicly traded SaaS company, marked in red, never achieves positive net income. There are a handful of outliers who have sustained positive net income for a while, but they are very few. Only 3 companies of the 48 have more positive net income years than negative net income years. However, cash flow is a different story. All 48 companies have recorded a year with positive cash flow from operations, and the median company reaches cash flow positive six years after founding, and sustains the trend. Some like LinkedIn do this in spectacular fashion, charting more than $569M in 2014 cash from operations. Which is a better metric of the health of a SaaS company, though, net income or cash flow from operations? For a quick primer on these metrics, see this short post the differences between Bookings, MRR, Revenue and Cash. Cash flow from operations measures the changes in the company’s bank accounts. Accounts grow when customers pay to use software, and accounts shrink as the company pays its employees, rent and other expenses. Cash flow break even means the company’s coffers are growing. The data above implies most SaaS companies grow their cash reserves each year. This is possible because of the frequent SaaS practice of asking for up-front payments from customers. On the other hand, positive net income means the company’s recognized revenue exceeds the costs of the business that year. It’s a much higher bar. Let’s paint the difference with an example. A SaaS company books a 3 year $3M deal. On the first day of the contract, the company’s cash balance increases by $3M, and the company can spend $2.9M for the rest of the year and still record a positive cash flow year. But the company can only recognize $1M each year in revenue, per the terms of accrual accounting, so to be net income positive, the company can only spend $1M on its R&D, Sales and Marketing, real estate, and all other costs. 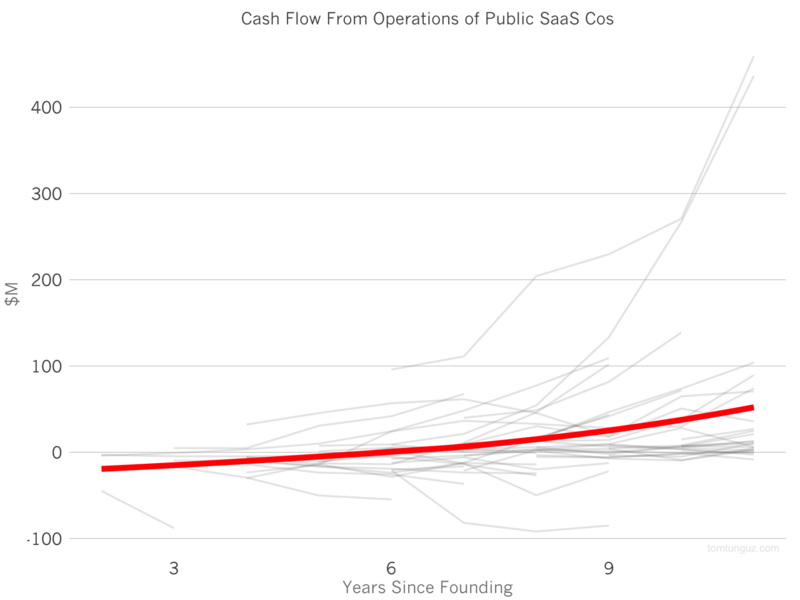 Most public SaaS companies prefer to invest their cash into faster growth at the expense of their net income. The argument of the day defending this tactic is that if the company wanted to achieve net income profitability, the business would simply stop spending as much to grow, and wait for the subscription payments to come in, yielding great profitability. We can argue both sides. But at this point, the market is rewarding SaaS businesses for growth, irrespective of net income. Should there come a time when the public markets demand both cash flow break even and net income positive businesses, then the consequence will be substantially smaller growth rates for many of these businesses because they will be far more constrained by the amount of capital they can invest in growth.